Born Corrado Marcarelli, the artist was born in Boston in 1913. The son of a journalist, his father's assignments abroad meant that the family spent several years in Europe; it was during these formative years that the artist had his first art lessons in Italy. At age 13 he moved with his family to New York City. There he studied at the Cooper Union for a year, and later worked as a teacher for the Works Progress Administration (WPA) and mural painter for the Federal Art Project. His work earned him the Logan Medal of the Arts. He later served in the army during World War II. After returning from service, Marca-Relli joined the Downtown Group, comprised of avant-garde artists working in lower Manhattan. He had his first solo show in 1948, and was one of the founders of the Artists' Club. He was chosen by his peers to exhibit at the Ninth Street Show in 1951, and subsequently exhibited in every New York Painting and Sculpture Annual from 1953 to 1957. 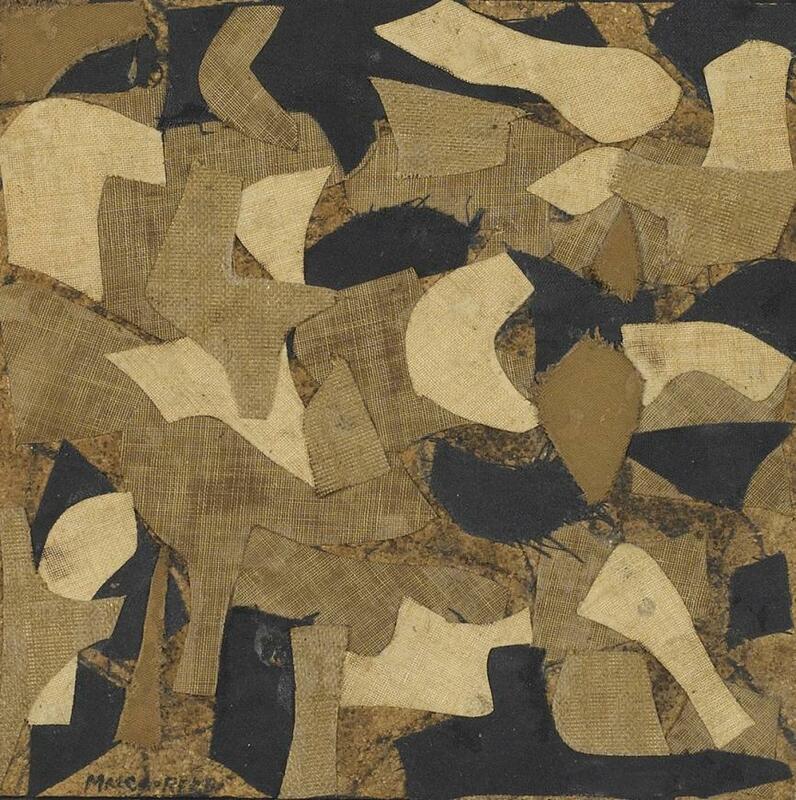 The Whitney Museum held a retrospective for Conrad Marca-Relli in 1967; of the artist, the show's curator, William Agee, said, "Marca-Relli's achievement has been to raise collage to a scale and complexity equal to that of monumental painting." After his death, he was made an honorary citizen of Italy. The artist is remembered for his charming nature, visionary abstraction, and fondness for fast cars. "Collage forces you to think and clarify ideas, with regard to both space and volumes. This discipline obliges me to think in terms of forms, outlines, real and imagined spaces, so as not to fall into the temptation of thinking that nature is a reality." Untitled 4484 is a forceful exploration into Conrad Marca-Relli's abstract imagination. Utilizing a combination of ink and collage-in which raw fabric and linen are stuck to canvas, creating broken surfaces and a jigsaw-like effect-Marca-Relli has created an agitated, texture-based abstraction. Marca-Relli was an important member of the New York Schol of Abstract Expressionists, and though he was influenced by the work of both Gorky and de Kooning, he was distinctly unlike his contemporaries in that he tended not to avoid representative subject matter. Works such as Untitled 4484 are evocative of surreal dreamscapes, visions of small worlds that were partially influenced by the artist's study of Giorgio de Chirico, an Italian Renaissance artist who painted buildings. 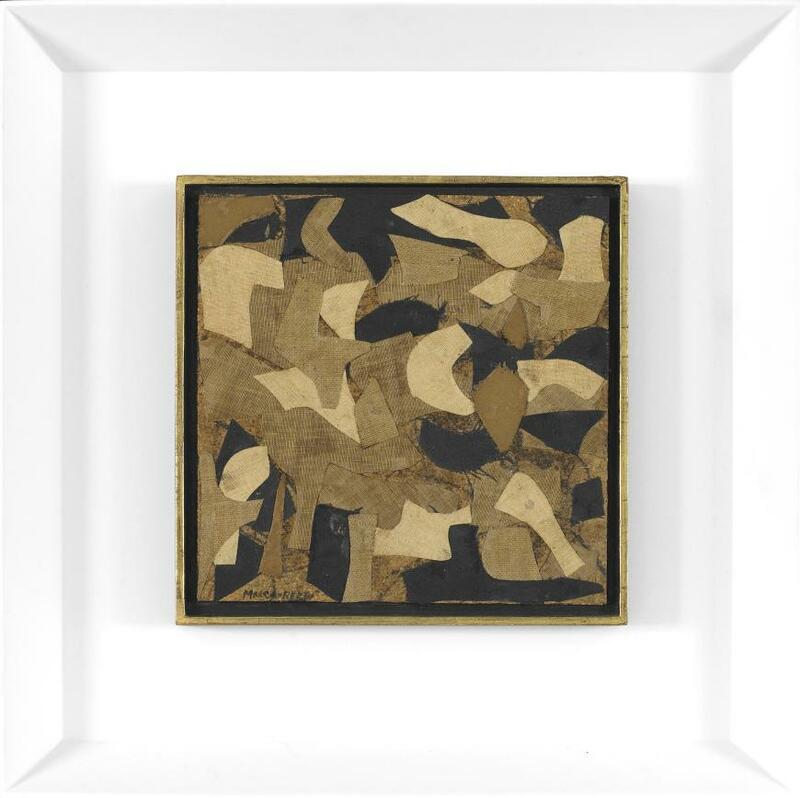 Untitled 4484 can be seen as architectural in its reliance on sturdy black marks and clearly-defined forms; at the same time, it appears strangely biomorphic in its expressionistic fluidity and raw edges. Marca-Relli's unique brand of automatism revolved around his belief that the creative process occurred "before conscious thought [could] censor out creativity."